Diabetes experts recommend that people with diabetes don’t require specific 'diabetic' meals on board; however, the non-diabetic meals may include sweet puddings. Eating the right food can be even more difficult when you are stuck on an aircraft with a restricted menu. If in doubt, it may be worth contacting the airline in advance. 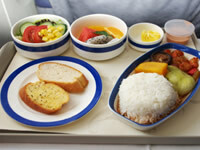 Airline meal portions do have a tendency to be quite small and this, together with the long wait times between meals on long-haul flights, means that people with diabetes should go prepared. Some airlines may provide a ‘diabetic’ meal option. If the airline does not specify what the options are, you may need to call the airline in advance or take a best guess at which option will be better for you. When it comes to dessert, the diabetic option may provide fruit instead of a sweet dessert. For the main meal, the diabetic option may be lower in fat which may or may not be a better option depending on which diet you follow. Airline food tends to be highly processed and may include added sugars and other additives. In truth, they usually don’t taste great and they’re generally not that good for you. You may therefore want to consider bring your own healthy food with you. If you are following a low carb diet, you can therefore choose to bring a meal with minimal starch (e.g. bread, cereal, rice, crackers, pasta) and consume only modest amounts of fruit and only in the form of berries, (which contain the least amount of fructose). Vegetables with a high fat dressing or butter are a great way to get more fat. Note that regulations on bringing food onto a plane may vary from one country or airport to another. Avoid bringing anything with a high liquid content such as soups or sauces as these will likely be taken off you at security. You will also need to have enough space in your carry-on luggage to bring your own meal. You will likely know which snacks are suitable for raising your blood glucose levels without being unhealthy. If not, do some research in advance and carry an adequate stock of snack food on board with you. This can keep you from becoming hungry and, if you’re on hypo-causing medication, stop your blood glucose levels from going too low. It is a good to stay well hydrated on a flight. Bottles of water are the best drink option. You should be able to take water with you if it has been purchased after you have gone through security. Going abroad is exciting, even if you have a long plane journey to get through. With all the distractions of films and games and the excitement of travel it is important to keep testing blood glucose levels and not to neglect your insulin or other medication. Airline meals may affect your blood glucose in different ways, so stay aware.